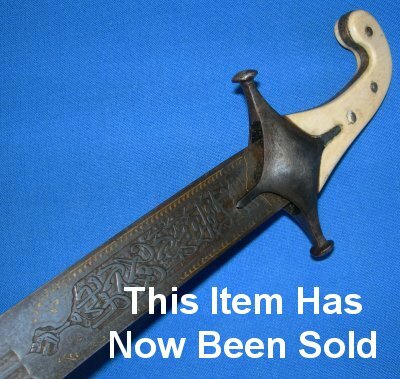 An exceptional Damascus bladed Shamshir complete with maker / armourer marks, in very good condition (some damage / repair to grip and hilt). A fine early to mid 18th Century Ottoman Caucasian shamshir, the near straight blade clearly reflective of the style in that region, most often seen on kindjals. The Islamic Arabic inscription and maker's / armourer's mark show this to be circa 1730. There is some slight damage to the hilt and a chunk of ivory missing, having been replaced with ivorine paste but this shamshir is a rare beauty. The Damascus wootz steel patterning is just visible; we have not cleaned it because of the gold inlay; any cleaning would need to be done by a professional. But the patina clearly shows a strong and very well made blade. The wonderful nearly straight 33 inch tri-fullered blade is rare, typical of the Caucasian region under Ottoman rule. The blade is firm and solid in the hilt. The top langet of the cross guard is missing on one side (filled / repaired). One of the ivory grip sections has suffered a fair loss (filled / repaired). But otherwise the grip is in very good shape and the sword is in very good condition for its age. Further / full sized images upon request. Please quote item reference E58 (801).